We were fortunate today that we didn't get any of the rain that the weatherman said we would get, so I got to mow the lawn! And that's primarily what I got done on my first day of vacation. It seems that no matter when I start my vacation, the first thing I do is trim and mow the lawn. It makes it nice for the rest of the week, and I enjoy doing it. You can see that today I followed a curve as I mowed the lawn in the back. Yes, I am one of those gardeners who likes to mow her own lawn! It's good exercise and when you are done, you can see a result. So much of what we do at times doesn't show immediate results like that. Since the lawn is green and I seem to have a lot of white flowers blooming right now, let's go with a green and white theme for this upate on Gardening Vacation 2007. 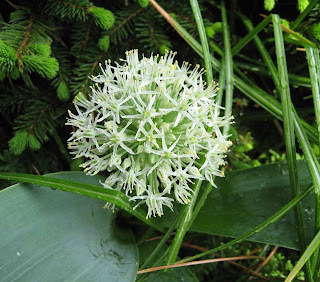 This little allium is blooming by the front step. It's one of my favorites. That bloom will last a long time and then the "skeleton" of the bloom will be around most of the summer until I cut it back. I believe this is Allium karataviense. It's one of my favorites. The only tulips blooming right now are 'Deidre', my late season green striped tulips. 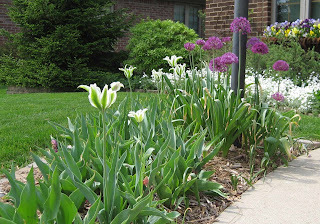 Around the lamp post are giant purple allium. I did not save the package, so I don't know the exact variety of allium. That white blur in the background is snow-in-summer, Cerastium tomentosum. 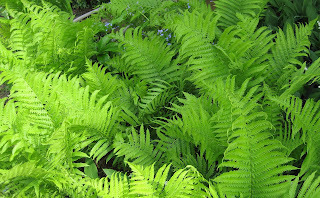 And in the back yard, taking up some of my precious shade, are some woodland ferns. I took these from my sister's yard, excuse me, she let me dig some of these up as passalongs. (I'm pretty sure I told her I was taking them.) My dad got these some time ago, so I am happy to have them in my garden now. (And yes, peaking up through the ferns are some Brunnera macrophylla flowers, False Forget-me-not). Now, some bad news. The rabbits have returned, if indeed they ever left. They have eaten quite a bit of spinach and a few pea vines. I don't like those rabbits. They are vermin. And some good news/bad news. 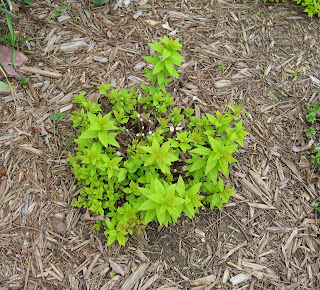 The good news is that the Limemound Spirea (Spiraea japonica 'Limemound') that I cut down to the ground earlier this spring are all coming back! The bad news is now I can't just cut out the roots, I have to try to transplant these to some other spot. I think I'm going to give some of them to my neighber. I know based on comments I got on the post about removing them that it would not be good to let them grow back where I initially mis-planted them! Poor design on my part. Tomorrow, weather permitting, I'm declaring it Hosta Sunday, because I plan to dig up and replant my hostas and make room for my giant passalong hosta. Then on Monday, when everyone else goes back to work, I'll be going to garden centers! I haven't yet had to mow the lawn which looks nowhere as good as yours! LOL as I just finished a 'lawn' post. It must be on all of our minds today. Or, at least ours! Just so you know, I am envious of your perfect lawn! I'm eager to follow along with Gardening Vacation 2007. Is this an annual event? 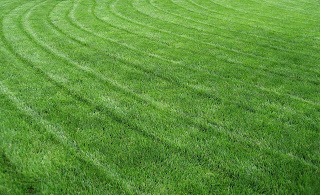 And I love the curves in your lawn mowing pattern. Wow your lawn sure looks nice and green!! All of your garden pictures are beautiful! I have never seen green tulips. Mmmm - love your green and white theme, Carol. There are so many shades of green, and all kinds of white. The curvy lines do look good. II just saw a New England garden in the current issue of Cottage Living [thanks, sis] where the central lawn is mowed in a circular fashion, and this simple idea does add elegance! Your early spring garden looks green and fresh. It's so nice to see the spring photos from more-northern gardens now. Oh what a lawn, Carol, you are a mower after my own heart! Wavy lines are so much more fun than straight rows. I love mowing my lawn too! Even if I haven't weeded or deadheaded anything, just mowing the lawn makes the yard look so much better. Those Deirdre tulips look very pretty, a bit like Spring Green. Layanee... I am envious that your whole garden is much bigger than mine! Susan... Gardening Vacation is an annual event, I've taken off in May for probably the last 15 years! Laura & Chris... thanks for the lovely comment. I'm thinking about getting more green tulips for next spring. Pam/digging... Thanks, and we northern gardeners look forward to showing you our blooms on the 15th for Garden Bloggers' Bloom Day. LostRoses... from one mower to another, thanks for the nice comment. 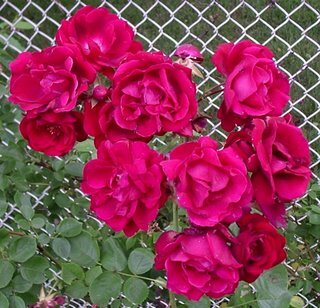 OldRoses... I agree and maybe that is why I always mow, first. 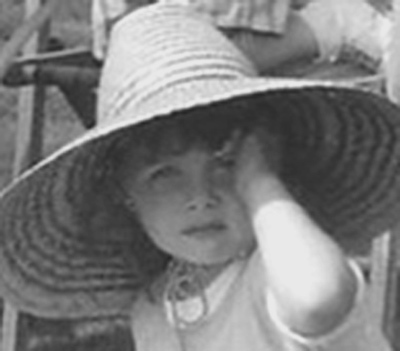 Yolanda Elizabet... I'd be happy to come over and mow your lawn. I just need a passport and a plane ticket! cherub*kisses...You can keep annuals by watering them well and then moving them in to your garage at night then back out during the day until it is warm enough at night to safely plant them. Opps....I just read the previous comment - am I in trouble because I took advantage of the weekend and planted a bunch of annuals -- is it too soon?